Flatbed Towing or Dolly Towing? That is the Question. Let’s take a look at both these types of towing and see if we can find an answer to this question. When you call in for towing service the towing company will ask you several questions about your vehicle and the circumstances of your tow. These questions are important because they enable the dispatcher to know what type of truck to send and the operator to plan for the tow so that once they arrive they will be able to carry out their work in the most efficient manner. Flatbed towing is done in a tow truck that has a long flatbed on which the towed vehicle is placed and secured. A flatbed truck can be lowered to a ground level allowing the vehicle to drive onto the truck bed or be pulled onto it. So, what are the advantages of using a flatbed tow truck? Well, first of all, this is the most convenient way of towing. 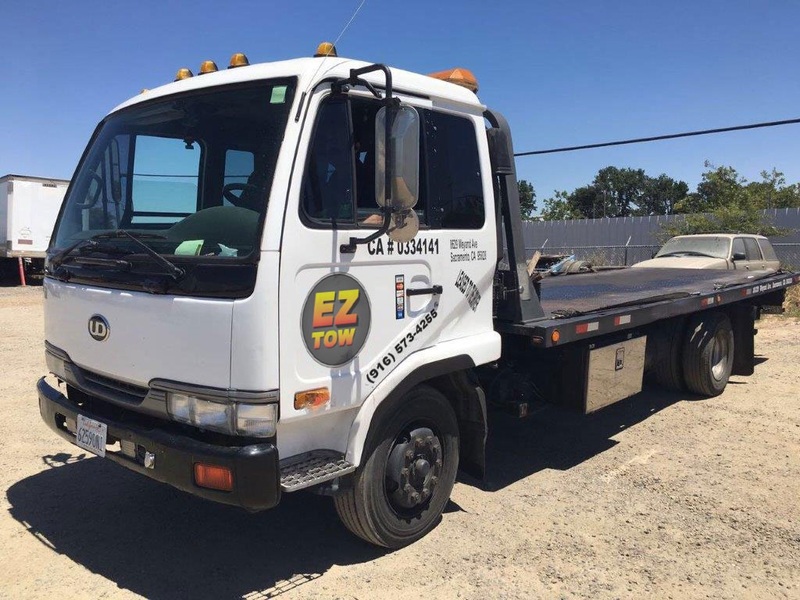 Flatbed tow trucks can carry different types of vehicles, from classic cars to vehicles that have been involved in accidents and cannot be towed by any other means. 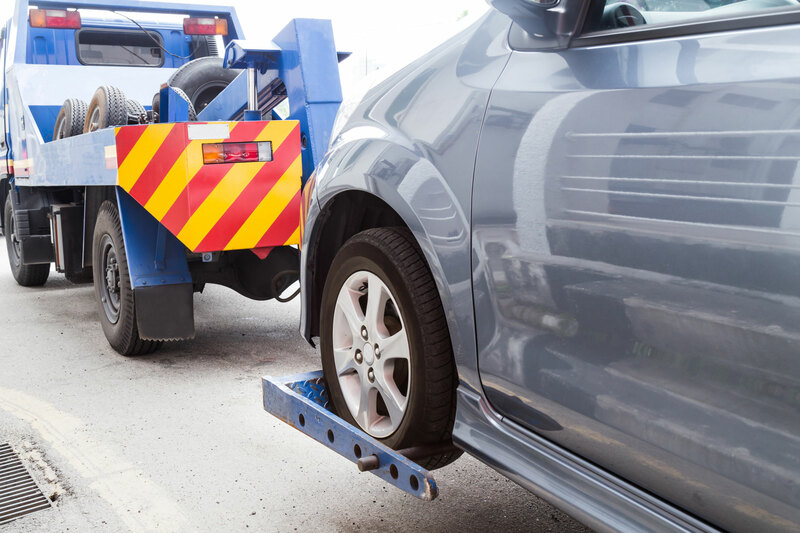 Cars that are towed on the flatbed are basically just sitting there and none of their parts are used, they are not towed on their tires, for example, and this means that there is no wear and tear whatsoever on the car during the tow. Flatbed towing is also considered the safest means of towing vehicles. Any type of vehicle can be towed on a flatbed, no matter what state it is in and flatbeds can also handle very heavy vehicles. The operator will drive the vehicle straight onto the flatbed or if that is not possible he will use the winch to pull the vehicle onto the flatbed. Once the vehicle is on the truck’s bed the operator will secure it in place. You may be wondering why to use any other type of tow truck if the flatbed is so easy to use, safe and convenient; well, flatbed towing does have a disadvantage and that is cost. A dolly is an unpowered trailer which is connected to a truck and the front wheels of the towed vehicle are connected to the dolly so that the vehicle can be towed. Tow dollies are used to tow vehicles that have been involved in accidents or that have broken down and cannot be driven to the garage. Although dolly towing is not the most convenient way to tow a vehicle it is one of the more cost-effective means of towing. Another advantage of dolly towing is that it is quick to hook the vehicle to the dolly. Dollies are better for smaller and lighter cars. The biggest disadvantage of using a dolly is the wear and tear it has on the vehicle, which has two wheels on the ground during the entire duration of the tow. In our opinion the flatbed wins, but of course we have to look at each case individually before deciding. We are always happy to help our customers decide which method of towing to choose, taking the type of vehicle, distance of the tow and budget into consideration. Easy Towing offers towing and roadside assistance services to motorists in Sacramento and Elk Grove, CA. Please don’t hesitate to contact us for more information about our services or to request our service. Our teams are available 24/7 and deal with all types of roadside emergencies.